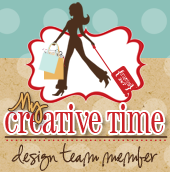 Welcome to day 12 of the My Creative Time 12 days of Christmas. WOW! Can you believe we are done!!!! Did you get inspired??? I know I did! I love all the ideas my design team sisters have come up with. If you haven't been following along please start here. 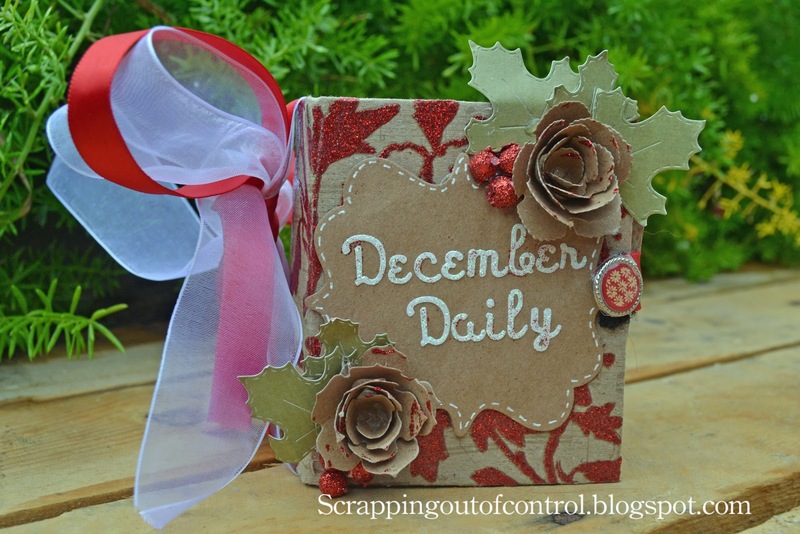 For my project today, I made this cute little mini album using the 3 by 4 envelope die. I have been taking a photo each day and posting it on Instagram. My plan is to get the photos printed out and slide them in each pocket. Cute right? If you don't know what Instagram is click here. If you are interested in printing out your photos click here. I added some rolled flowers and leaves to my cover. Btw, my cover is made out of a recycled cereal box. I used the accordion blinding method to bind my book. Click here if you are interested. I added a day leading to Christmas Day. I just love this little book!!!! Here is a sample of how it would work. I actually used my Fuji Intax camera for this but had to cut it down to size. The Instagram photos are 2 by 3 and should fit. Here is one of my Instagram pictures going into the alum..Super cute right?? Thank so much for stopping by today! I hope you enjoyed this awesome 12 Days of Christmas series! Make sure you visit the design team and leave a comment! Good luck! Big crafty hugs and happy holidays! 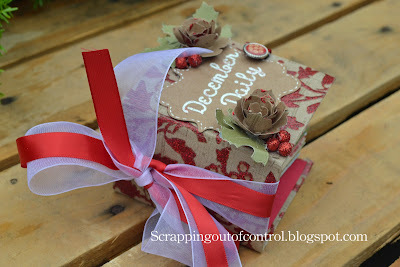 Oh wow, love what you did with the dies, so creative, gr8t job! Oh my goodness what a cute...and awesome idea...I love it you and your little guy is precious and a handsome little fella! Thanks for all your hard work in these 12 days you have played a big part in providing some awesome and fantastic ideas and just know I had a blast! This is gorgeous, Nancy! What a wonderful keepsake it will be! And your little one is such a cutie!!! Such a thoughtful, heart-warming album; a keepsake for sure! Beautiful idea (I'd be tempted to make one for every month...). I may scrap-lift this as a gift for my sister-in-law - with my niece and nephew becoming more adorable every day, she'd love to have such a sweet album to capture their cuteness moments. Hope you don't mind if I 'scrap-lift'. For all the projects you've shared over 12 Days blog hop - Thank you! For all the projects before - and those yet to come - THANK YOU! You are inspiring!! This is such a great December daily album....it's like a work of art. 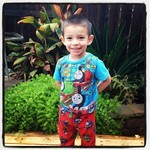 And that photo is too precious (I miss the days of my little guys being into Thomas...they grow so quickly). Thank you for all you've done to make these 12 days inspiring. Happy Holidays. slbuller at fullchannel dot net. Wonderful mini album! What a great way to use the 3 x 3 fancy envelope die! TFS! WOW!!! This is amazing! What a fabulous idea!!! WOW~~~ This is such an awesome project! FAB idea to use those enveloped as the pages!!! Ok....next year! I am making this!!! I will get one to my daughter and daughter-in-law and they can take the photos. What a great idea!!! This is truly wonderful. Who doesnt like to take photos and store them in a beautiful place. Thanks for sharing your idea with us. This is a fantastic idea, I love it. You did a beautiful job on this mini album! 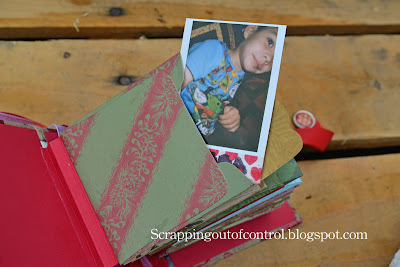 Super cute mini album...love the colors and embellishments, especially the flowers! Wow, Awesome Mini Album, I have to give it a try, thanks for sharing. Nancy ~ Shut the front door on this mini!!! OMG!! Where do I begin and is there enough words for me to tel you how much I LOVE, LOVE LOVE this!! NOPE!! I just saved the links to my favorites for future use!! I have to say this is so CLEVER, CUTE and BEAUTIFUL!! You know someday your children are going to look back and think lok what are Mom did for us!! And you can show your grandbabies too!! SIMPLY AMAZING!!! Wow!! This is soooo awesome!! Love this idea!! 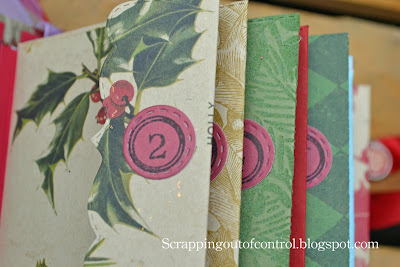 very cute and love all your different papers! What an awesome mini albumn. I will have to try making one of these. All the projects over the past 12 days have been fantastic. Have a Happy Holiday. Love this idea, so cute. Thanks for the video. Super cute is right. 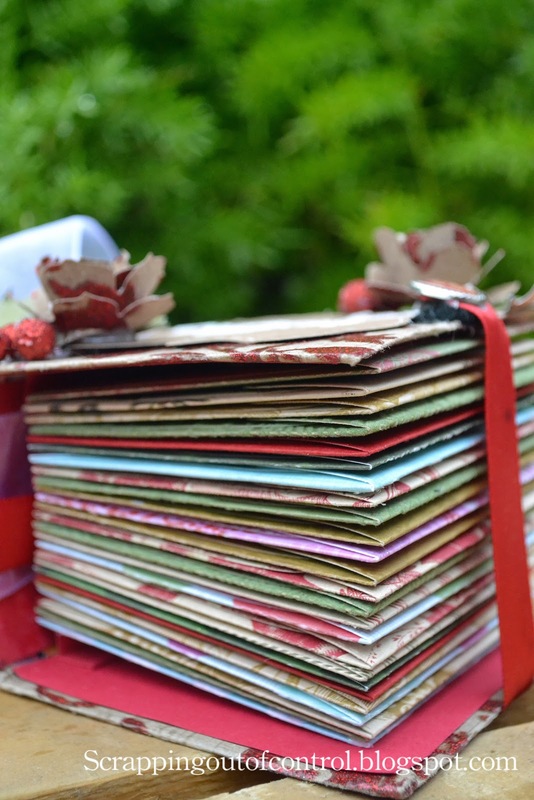 You did a fantastic job with the sweet album and I like that the pages are envelopes to hold everything. This is super cute and the neatest little album I have ever seen. Little book?? Oh My Goodness! Awesome job. The maple leaves look pretty with the flowers and I like the closure! Pretty cute pictures and the circle numbers are perfect. Beautiful! What a cool book and a great way to make the memory for the month. Love it. Another great project! Your mini is just adorable. Hope you don’t mind if I scraplift it. What a great tutorial. Thank you for taking the time to share this with all of us. The 12 days of Christmas series was very inspirational. Wow, so much detail. 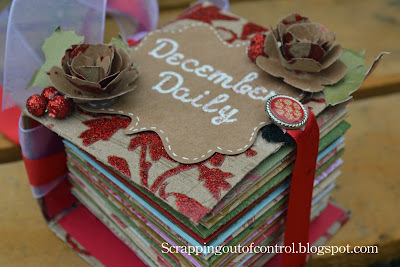 Lovely album with daily containers. You sure did a nice job on this mini album! It's such a great way to look back at how you spent the month.